It got somewhat lost in the hoopla of the jobs report and the blistering rally in the stock market on Friday. But the US trade deficit worsened by 3.4% in October to $43.9 billion, according to the Commerce Department, once again disappointing soothsayers who’d hoped for an improvement in the trade deficit. But as bad as the overall trade deficit is, the trade deficit in goods (without services) is much worse, and even then, the oil trade covers up just how terrible the underlying trade of non-petroleum goods really is, how far and how fast non-petroleum exports have plunged, and how much US manufacturing is getting whacked. The worsening trade deficit was a nasty “surprise” – nasty because it dings US economic growth; and surprise because it appears inexplicably difficult for Wall Street economists to predict a downhill slope. Exports add to GDP, and imports reduce GDP. So when imports exceed exports, the sacred US GDP figures get hit as they have been since the 1990s. But October was bad: exports of goods plunged 10.4% year-over-year to $123.8 billion, the worst level since June 2011. The culprits: the strong dollar that makes US goods more expensive in other currencies, and tepid economic growth in the rest of the world, with some major markets in a recession, or a deep recession, such as Russia, or even worse, such as Brazil. The China slowdown isn’t helping. But in the case of exports to China, the dollar can’t be blamed since the yuan is pegged to the dollar, and the recent devaluation was tiny compared to the moves of other currencies. Imports of goods fell 6.6% year-over-year to $186.8 billion – despite the strong dollar, though a strong dollar, in theory, should have caused imports to rise. This testifies to tepid demand in the US. Imports of petroleum products were blamed. The US is – despite the oil bust – pumping so much oil for domestic consumption that imports of petroleum products have been falling for years. And in October, the value of petroleum imports hit the lowest level since 2003! In fact, the US is pumping so much oil that exports of petroleum products have been booming, and the net petroleum trade deficit – the difference in value between imports and exports of petroleum products – dropped to a minuscule $4.47 billion, the lowest since April 1999.
Credit must be given to the shale oil revolution – and to the many billions of investor dollars that have been drilled into the ground where they have now disappeared without trace! 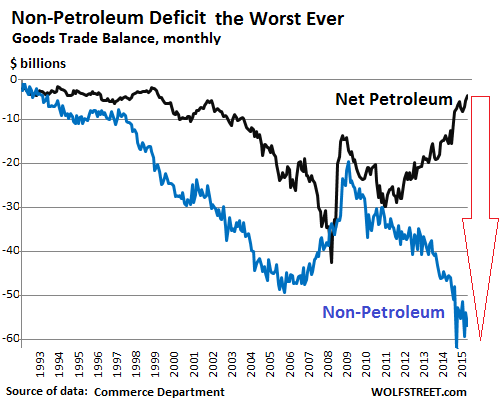 But this flourishing oil trade covers up the terrible deterioration in the non-petroleum trade deficit. It’s volatile from month to month, but the trend is clear: in October, it worsened by 25% year-over-year, to $56.8 billion, after an all-time worst of $59.3 billion in August. Before this year, the worst had been $47.8 billion – in December 2014! The reason for the rapidly deteriorating non-petroleum trade deficit: declining exports. In October, non-petroleum exports fell 9% year-over-year to $115.9 billion. The trend is worsening: year-to-date, non-petroleum exports dropped only 4%, but October and August were the worst months since 2011. 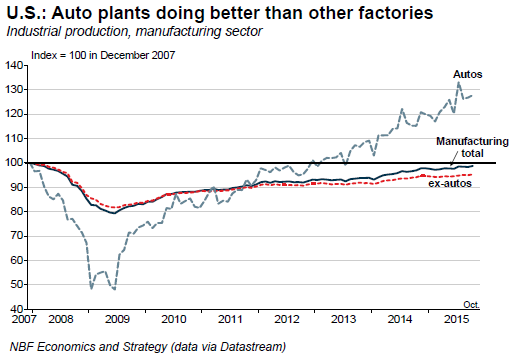 This swoon in non-petroleum exports explains in part the malaise in US manufacturing. What the regional manufacturing indices have been saying loud and clear for months, the national Manufacturing ISM Report On Business finally confirmed: for November, the index fell to 48.6 (below 50 = contraction), with new orders dropping to 48.9, not a good harbinger for the future. It was the first contraction since November 2012. Bad as it is, it has been propped up by the massive US auto manufacturing sector that has been flying high, pumped up by cheap credit, loose underwriting standards, extended loan terms, loan-to-value ratios that exceed 100%, the rising proportion of subprime loans, and of course, securitization of these loans [read… What Happens When the Auto-Loan Boom Blows Up]. And auto manufacturing is still hot, fired up by US auto sales that might soon set an all-time record in units and have already set all-time records in dollars due to higher vehicle prices. But auto manufacturing in the US isn’t for export; it’s mostly for the US market. Once the auto loan boom hits rough waters, as all loan booms eventually do, auto manufacturing too will get into trouble. This will pull out the last prop under overall manufacturing in the US. Joking aside, the problem is for everybody who can “retire” at age 44 there are a hundred who’ll have to work until their death even if they are debt free and have decent-paying jobs. Returns on stocks are nice and all: I benefited from Shanghai earlier this year before making off like a thief in the night (chances are I am on Beijing’s “malicious seller” black list) but stocks require time to be followed properly. And as Napoleon said, time is the most precious and irreplaceable commodity. The average saver needs decently yielding investment grade bonds to feather his nest, not stocks. Park your money in there and watch it grow safely and steadily so you can concentrate on other things, like raising children and dealing with the curveballs life throws at you. Now, of course banks offer “asset management”, but it’s reserved to big savers. My banks only starts offering it if you have over €200,000. And until June 2014 the entry point stood at half a million. As debased as the euro is, that’s a lot of money. Now even stocks have a problem: they are “narrowing”, meaning the good ones are fewer and fewer and more expensive, thus exposing you to a lot of losses even if they drop a physiological 1-2%. Amazon, the A component of FANG, presently stands at $660. If it drops just 1% it means you lose over $130 on a measly twenty stocks. Apple shareholders have felt similar pains earlier this year and AAPL refuses to bounce despite Apple still being Apple, meaning it’s doing great financially. Big hedge funds (including the biggest of them all, the Banque Nationale Suisse) have taken a pounding from AAPL dropping a seemingly measly $15 since its peak. work has been slowing since Q2 2014 but in January of this year somebody turned a switch and the work has slowed to a trickle. Oil is the critical cost component in every stage of production for goods and services. The price has more than halved from over $100 to less than $40 but still everyone I know is experiencing recession-like conditions. All the commodities are at rock bottom too. Something has seriously gone wrong and it’s the impoverishment of the middle class that is the root cause, I believe. Or you could say the impoverishment of the middle class is the result. It’s like saying the poor are poor because they lack money. I don’t know about your area but in Canada one problem is the ongoing increase in public sector wages and pensions. Our firefighters just settled for 95 K after five years, about triple the salary here for a pretty good private sector job. That’s with no post- secondary ed. A bunch of California cities have declared bankruptcy- the cause- fire and police etc. salaries and worse, pensions that permit retirement at 50. E.g, San Jose. Then comes the education and health bureaucracy. Years ago, a freedom of information demand revealed that the University of Toronto had 500 non- faculty staff making over 100K. Incredibly when these things go to arbitration they only consider public sector salaries as comparables. It is taken for granted at law, that the same job pays more if its public sector. All this gravy has to come from somewhere and it’s not from welfare types. It can only come from private sector taxes. In Florida cops make more money than in places like NYC or Chicago. If they have any kind of rank above a regular cop they make in the 150K+ range, no kidding. Check out some articles in the Miami Herald about the highest paid employees in the city, all cops and fire rescue. The fire rescue guys make about 113K and they ride 3 in a truck, by union contract. The USD continues to gain against many asset classes. It’s all nice from a domestic pspective until US exports start to crash from it. Then there’s a price to be paid. Off topic… Can someone explain: The Mexican government sells a boatload of pesos on a regular basis to support the peso. How does selling pesos support value. One would think the opposite reaction would occur. 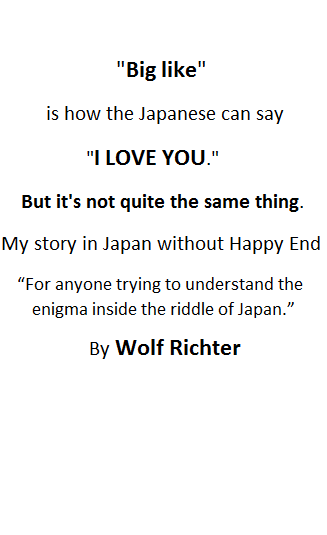 It doesn’t make sense to me either. Maybe it’s an error (by Reuters) in the first paragraph? In the 2nd paragraph, the two-paragraph article talks about “dollar auctions,” which is what the Mexican central bank has been doing (buying pesos, selling dollars to put a floor under the peso). Maybe they are referring to the silver Libertads which are one ounce silver coins with a one peso denomination. Foreigners buy a lot of these.